There is neither pedestrian bridge nor underpass in Sanya due to historical reasons, cut-ins between pedestrians and vehicles are usually seen on Sanya roads. 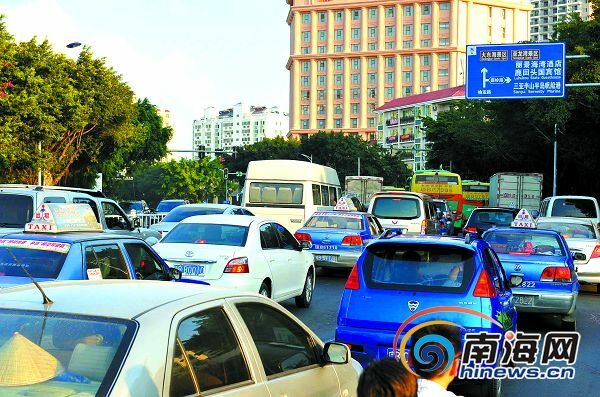 The traffic in Sanya is under great pressure as the city size expands unceasingly. According to a questionnaire survey launched on tianya.cn, a very popular forum in China, 92% voted for building pedestrian bridges or underpasses in Sanya. There is neither pedestrian bridges nor underpasses in Sanya due to historical reasons, and cut-ins between pedestrians and vehicles are usually seen on Sanya roads. For example, people are easily trapped in the intersection between Yingbin Road and Fenghuang Road. “The road is so narrow that we usually wait a long time during the rush hour,” said Mr. Zhang, an office worker in Sanya. Jiefang Road is a high street in Sanya, but its traffic current situation is not so well. The vehicles come and go in congestion, and the traffic is very slow. According to an official from the Sanya Urban Planning Bureau, they have no plan of building pedestrian bridges or underpasses in Sanya at present, but they have authorized a related research on part of congestion sections in Sanya by experts from China’s Urban Planning and Design Institute. They will take measures according to the practical situation of the research.